With his win at the Sony, K.J. Choi has won on tour four straight years. Only Tiger Woods and Vijay Singh have longer active streaks. The football coach hits the Big Island on his last day before going to his new Dallas gig. Police investigate the slaying as lawyers float theories of drug gangs and jealousy. Some 800 people were expected to attend the ceremony at the First Presbyterian Church of Honolulu. The scholarship for Kahuku student Tiffany Polk will also cover room and board. Commerical photography assistant Brian Sato keeps his passion for the medium alive with fine art shots. 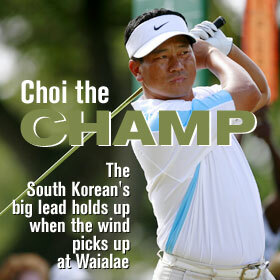 The South Korean's big lead holds up when the wind picks up at Waialae. The Hawaii forward has worked through a leg injury to give the 'Bows a veteran presence in the post. Jon Kane works for AirMed Hawaii as a nurse, helping move patients interisland. The secretary of homeland security is giving states until May to accept a driver's license program or face obstacles to air travel. The state DLNR has outlined a plan for streamlining the process of keeping land document records.